Having a dog can mean so much more than having a companion. They depend on their human caregivers to provide food, water, shelter and safety. 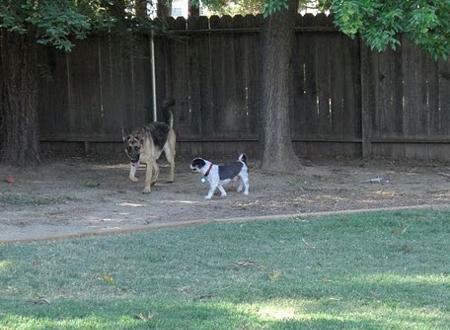 Having a backyard area is one way to keep your canine friend happy. But, just like anything else you do for your pet, you must take safety precautions. Below is a list of things to consider when modifying your outdoor environment to be dog friendly. Plants. While some plants are beautiful and add variety to your garden, they can be toxic for your pet. Whether you're a do-it-yourself landscaper or you have hired help, take the time to read the list of poisonous plants before you add them to your yard. Fruits. Avocados are poisonous for dogs as well. Skipping out on homegrown guacamole could save your pet's life. Prickly Plants. Believe it or not, dogs are deterred by thorny or textured plants. Roses and lavender are beautiful and Fido is less likely to go exploring where they are planted. Fencing. Hopefully you never experience the feeling of your heart in your stomach that comes from realizing your pet has escaped the safe confines of your backyard. Choosing proper fencing material and height can drastically minimize the chances of your pet getting out. There are three types of fencing available; choose whichever suits your dog's breed and desire to tunnel out or jump over the fence. Potty Patches. Like obedience training, teaching your dog to relieve itself in specific areas of the yard will help prevent the yellow burn marks that come from urine. Pet Pathways. Continuous walking on the grass will also cause deterioration. Having pathways of concrete or smooth rock can prevent the extra wear-and-tear. Also consult a landscaper about the most hearty or durable grass type for your climate. Dog House. No canine friendly yard is complete without a dog house or shelter provided to give your pet a place to stay dry and out of the elements. While you should never leave your pet outdoors for lengthy durations, it's a nice to give them the option to relax in their own place. Shade, shade and more shade. As the warmer weather is just around the corner, having shade to escape the direct sunlight is essential for your dog. They don't have sweat glands, and they can overheat from being left outside. Water feature. Your dog will obviously need to quench his thirst while exploring his yard. Having a fountain or other water feature adds beauty while remaining functional as well. It is important to keep the fountain clean of debris. Digging Deterrent. Using rock or elevated gardens will discourage your dog from digging and also add an element of nature that is pleasing to the eye. There are many other fun ways to make your yard Fido Friendly. BE creative, and always check with your veterinarian and landscaper before making any additions that could be harmful. It is possible to have a yard that is both beautiful and dog-safe.